With a lot of cards selling at less than ten percent of their book value, it's nice to come across a set that has held its value and even exceeds published values regularly. My undervalued set of the month is 1995 Action Packed Hall of Fame Basketball Autographs. Originally available through redemption, this set consists of autographed versions for 37 of the 38 cards in the set (Pete Maravich, card #26 was unsigned). In addition, Action Packed included autographed cards of Bob Cousy and Bill Russell. Russell's card is the only one that is serial numbered (/500). This set gives collectors an opportunity to get on-card autographs of Hall of Fame players and coaches at very reasonable prices. It also features the only on-card autographs of several coaches. That being said, the published value for these cards is low, considering the checklist. All but the Cousy and Russell card have a low value in the $4-8 range and high book value between $10 and $20. Roughly half are selling at low prices, a quarter at high book value and the remaining quarter above book. More specifically, the John Wooden, Bobby Knight, Chuck Daly, Bill Walton, and Red Holtzman cards have sold especially well when compared with their published prices. This is a fun set to collect and relatively inexpensive. I'd recommend saving the $80-90 you might spend on a new box of cards and use it to get around eight to ten of these autographs instead. How much would you be willing to pay if you were guaranteed a Hall of Fame autograph per pack? My advice is to find someone who is willing to trade. 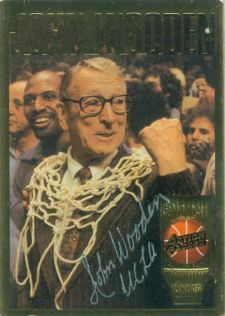 In the case of the John Wooden card, $20 for an on-card autograph of the greatest coach of all-time is a great deal. That is, if you can find someone to sell you one. i have the Jack Ramsay auto from that set!